1. The Bassatine cemetery is still there. What has disappeared are the marble slabs which were vandalized in the late 1960s when local production of the stone could not meet rising demand induced by the emergence of new shops and boutiques in downtown Cairo's commercial district. Hence the black marketers who pillaged all kinds of semi-abandoned cemeteries. 2. The Bassatine cemetery was never under threat of annihilation by the state or any of its departments. There was, however, the question of relocating 300 graves to make way for the new Ring Road. And had the cemetery indeed disappeared, it would have been either because of the upsurge of squatters or because of its total neglect by the Jewish community, or both. Thankfully, a member of the community - Carmen Weinstein - stepped in to reverse this precarious situation in 1978. 3. We would like to inform you that against all odds, the non-profit organization SAVING THE JEWISH CEMETERY OF BASSATINE ASSOCIATION (under formation and headed by Carmen Weinstein) remains committed, since 1978, to saving and maintaining the Bassatine cemetery. The association would like to reassure you that the cemetery is still there, albeit in shrunken form. The 60 feddans that represented the Kara�te part has indeed been sold off. What remains is the equivalent section belonging to the Rabbinical denomination, a large part of which has been successfully reclaimed thanks to Herculean volunteer work initiated and spearheaded by Weinstein together with financial help received from the many friends of the cemetery. We take this opportunity to thank all those who participated with money or in kind towards the attainment of "some" of our goals. We stress the word "some" because there is still much that remains to be accomplished. 4. The Bassatine cemetery still serves its original purpose, because, sadly, we mourn the loss of four members of our small community who have passed away during these last 10 months. They were duly buried next to their loved ones. 5. The first generation of trees planted in 1993 within the cemetery walls have grown spreading their welcome shade. This in itself is proof that with patience, resources and guardianship, even the most forgotten of cemeteries can come alive. Lastly, many don't realize, but Bassatine is the second oldest Jewish cemetery after Jerusalem's Mount of Olives. It goes back to the days of Sultan Ahmed Ibn Touloun (r.868-884 AD), founder of the Touloun dynasty in Egypt. Bassatine cemetery was conceived over 1,000 years ago when the sultan ordered the creation of a public square in his new city of al-Kata'e (The Wards) north of al-Fostat, necessitating the removal of Christian and Jewish cemeteries. To compensate the Jewish community for the loss of its communal graveyard, the sultan summoned Saadia ben Joseph, also known as Said al-Fayoumi, an Egyptian Jew regarded historically as an outstanding Jewish literary and political figure in the middle ages, and informed him that his people would receive 10 hectares in the desert area of Bassatine. Many prominent rabbis and talmudic scholars were subsequently buried there. It now appears our Jewish brethren were not the only cherished entities buried there. A pit in the Bassatine cemetery was used to lay away some discarded old books, scrolls, documents and sacred works. It is there that a new Cairo geniza was partially excavated in 1988. For more information on the Cairo geniza we invite you you to click on a dedicated Cambridge University homepage which devotes an entire section on the subject. Search under "Cairo" or "Ben Ezra". The cemetery made world news in 1989 following the announcement that the Cairo governorate had plans to build a Ring Road to relieve the enormous traffic congestion in the center of the city. The plans called for a small part of the 80-meter-wide road to run through approximately 500 meters of the Bassatine cemetery. The exact area where the road would intersect with the cemetery was based on an aerial survey conducted by a specialized French agency. Relying on visible landmarks, the agency failed to take into account what was lying beneath the surface. In view of the absence of any rabbinical authority in Egypt, the tiny Jewish community of Cairo consulted chief rabbis elsewhere on whether it would be permissible to move the 300 graves to another part of the cemetery. Egypt clearly treated the Jewish cemetery issue with kid gloves in an effort not to alienate dovish figures like Israel's former Sephardi chief rabbi, Ovadia Yosef, who visited Cairo in 1989 to confer with President Mubarak on the cemetery issue as well as other matters. The Egyptian president had already been made aware of the problem when he met Nessim Gaon, the president of the Geneva-based World Sephardic Federation, during Emperor Hirohito's funeral in Tokyo. Following Yosef's visit, President Mubarak sent him a message saying that he had personally delayed construction of the highway giving the Jewish community time for reflection and consultation of halaka. There were strong indications at the time that the chief rabbinate in Israel was leaning toward a lenient solution that would enable the graves to be moved to another part of the cemetery, especially as there were precedents for such actions. Because the Ring Road was also going to pass over Moslem and Christian cemeteries, these were removed despite the fact that opening a grave is considered a desecration under Moslem law. Yet, in view of the pressing circumstances, exceptional sacrifices had to considered. Meanwhile, Jewish groups elsewhere, headed by "Atra Kadisha" and far less lenient than Rabbi Ovadia Yosef, enlisted Jewish preservation and heritage organizations worldwide as well as US congressmen in their cause. A notable delegation of Jewish religious leaders from Europe, the US and Israel arrived in Cairo. They met with senior Egyptian officials to present the delegation's objections to any step that would disturb the graves in the Bassatine cemetery also expressing their concern at the terrible state of neglect there. The eight-man delegation met in turn with the governor of Cairo, the minister of construction, and the US ambassador. The visiting delegation, which included Rabbi Hertz Frankel, dean of the United Talmudical Academy and Beth Rachel School system in Brooklyn; Rabbi Zvi Kestenbaum, head of an economic development corporation for small businessmen; Rabbi Baruch Hellman of Canada, a consultant to the World Jewish Congress; Shimon Nissenbaum, a businessman who has funded through his foundation the restoration of Jewish cemeteries in Eastern Europe; and Rabbi David Shmidl of Jerusalem, the head of the Atra Kadisha society, reaffirmed the great historical significance this 1,100 year old cemetery to the Jewish people all over the world. They also saw for themselves that there was a lot of work to be done at Bassatine. After 40 years of neglect, the cemetery was ostensibly littered with garbage, broken stones, and hundreds of squatters who were living there without sanitary conditions. Moreover, there was no apparent group or organization responsible for the cemetery. 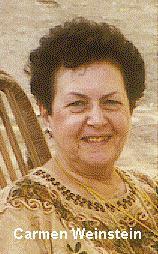 It was obvious the small Jewish community of Cairo had neither the funds nor the apparatus to do much about it. As for the various international committees for the preservation of Jewish cemeteries around the world, their focus to date remains on Eastern Europe. These were some of the criticisms leveled out by Carmen Weinstein to the visiting delegation during a meeting at the Adly Street Synagogue. Frankel retorted that he had never heard of the cemetery's predicament or of Carmen's appeals to save it! On the other hand, Nissenbaum advised Weinstein that she could rely on his foundation's future support and contributions. Regrettably, neither have been forthcoming to date! During the visit, Rabbi Frankel produced a copy of a letter written on May 23, 1989 to the US ambassador to Cairo, Frank Wisner, by New York congressmen Stephen Solarz and Benjamin Gilman. The letter informed the ambassador that "among the Jewish community worldwide, there was a consensus towards working for an alternative solution to the proposed highway. The goal is to ensure that the graves remain intact and untouched." The alternative referred to the idea of building a bridge over the part of the cemetery to be traversed by the road. WSF's Nessim Gaon also expressed interest in checking out the feasibility of a bridge. While the graves of three other cemeteries - Christian and Moslem - were moved to make way for the road, Egyptian officials were committed to respecting Jewish laws forbidding the disturbance or relocation of burial sites. Work on this section of the Ring Road was halted for two years as Jews from international groups and Israel, discussed with Egyptian officials options for continuing the road's construction without causing harm to the graves. A solution was reached based on an American engineering company's (Lev Zetlin Associates in New York) plan that would allow the Cairo road project to go ahead without disturbing the graves by building a bridge. The proposed construction resembles a viaduct supported by embankments on either side of the site with access tunnels to allow visitors to reach the graves. The marked and unmarked graves, would be enclosed by the embankment. Visitors wishing to visit the marked stone graves - some with scroll or Magen David carvings - would find them in separate tunnels, each one wide enough to cover two rows of graves. At the writing of this message, we are pleased to report that further delays notwithstanding, the bridge is under construction. At this point we would like to state that even before the 1989 visit of the high powered delegation to Bassatine, efforts to save the cemetery had already begun. We shall not go into more details since these were adequately listed in the first issue of Bassatine News; it would be redundant to reiterate them here especially since we are already short of space. If you haven't received a copy please write Carmen Weinstein at the following address: Weinstein Printing & Stationery, 28 Cherif Pasha Street, Cairo, Egypt. But before we sign off, rest assured that the battle to save the cemetery continues. Squatters, actual and potential, remain the single most important threat to the cemetery. The situation is getting more crucial as Cairo's demographic pressures continue unabated. The legal process of repossessing private family graveyards - Ades, Sapriel, Haim Nahum, Levy, etc. - located outside the main cemetery walls is slow and tedious. Compensation money has to be paid in order to persuade squatters to vacate these premises. There is also the problem of general upkeep, maintenance and securing the areas that are presently within our jurisdiction. Additional donations are therefore urgently needed. We must also explore long-term sources of sustainable funding. It is pointless to restore parts of the Bassatine Cemetery knowing that one day we can loose it all because of lack of operational funding or resources. An example of what can be done already exists in Egypt in the model of the Commonwealth War Grave Commission, the designated international organization that is physically and morally responsible for more than a dozen cemeteries in Egypt where soldiers of the British Dominion (WW1) and the British Commonwealth (WW2) armies are buried. Because of the limited financial means available, we urge those of you who receive Bassatine News, to photocopy and send it to those you believe might be interested. At this point in time we have to rely on the chain system in order to get this modest publication circulated. The first week of February 1996 saw an unprecedented attendance of Egyptian Jews at a Tel Aviv University symposium where an unexpected message was heard loud and clear: SAVE THE RICH JEWISH HERITAGE OF EGYPT FROM JEWS. You read it right the first time "from the Jews". The first rumors that something was amiss began to circulate in August 1994. It appeared that the current president of the Jewish community of Cairo, Mr. Emile Rousseau, was planning to sell off the garden and annex of the small Maadi synagogue. Built with private funds in the early 1930s the Meyr Y. Biton synagogue saw its heyday in the 1930s, '40s and '50s when Maadi was home to a thriving Jewish community. The synagogue's congregation today is made up mostly of Israeli diplomats who show up at the synagogue mainly during the Yom Kipur-Sukot week. In view of loud protests raised from within Cairo's Jewish community and concerned members from public at large, Rousseau's plans were aborted. Uncovering what was about to happen with Maadi's synagogue was relatively easy because it stands within reach of the Israeli ambassador's residence and because it is of considerable importance to the heritage-minded dwellers on Maadi. A letter to the editor of the Egyptian Gazette best sums up the dismay at the action taken by Mr. Rousseau. "After the peace treaty between Israel and Egypt, we hoped that the Maadi synagogue, like its counterpart downtown would be restored. After a long wait we now find it is going to be carved up and turned into high rises. 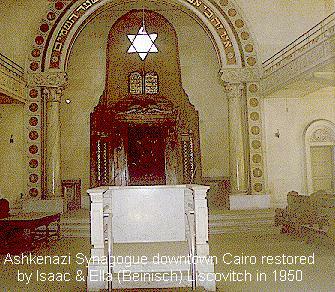 It is ironic that the Maadi synagogue survived during the period when Egypt and Israel were bitter enemies and now that relations between the two countries exist, a Jewish landmark in Maadi will be eradicated". The Port Said synagogue is another sad story. True, there are no Jews in that city and few visited it. But was that enough reason for the president of the Jewish community to sell off that city's only surviving synagogue for albeit a hefty sum ($132,000) as real estate? His predecessor, Yosef Dana had already done away with the city's other synagogue as well as selling off several other movable possessions. Chandeliers, candelabras, Prayer books, artifacts and other Judaica, supposedly in the custody of some of the unused synagogues, are being peddled and disposed of as collectors items. It now appears that one of the remaining Cairo synagogues is about to be rented out as a warehouse! These and other infractions by Mr. Rousseau and his predecessor were among the subjects discussed during the Tel Aviv symposium last February. Perhaps this is one of the reasons why suggestions were put forward at the symposium that in order to ensure the survival of Jewish landmarks, Torah scrolls and other Jewish religious artifacts in Egypt, they should be catalogued and placed under the protection of the Egyptian Antiquities Department. A letter to that effect was prepared on 17 March 1996 by the 'Israel-Egyptian Friendship Association' of Tel Aviv and sent to the Egyptian authorities. Hopefully these measures will place our heritage beyond the reach of those who have ulterior designs on how to dispose of them. Meanwhile, the Symposium's organizer, Professor Shimon Shamir (Israel's former ambassador to Egypt), praised the Egyptian authorities for their protection of Jewish sites. Other speakers at the symposium included Professor Yoram Meital of Ben Gurion University; Ronen Bergman who in January 1966 authored a series of articles on the Jews of Egypt for Ha'aretz; Charles le Quesne who worked on the restoration of the Ben Ezra synagogue in Old Cairo; and Carmen Weinstein who is responsible for the Bassatine Cemetery in Cairo. Speaking at the symposium, Weinstein reminded her audience that illicit disposal of Jewish landmarks in Egypt by the extent Jewish community of Cairo (or Alexandria) would be tantamount to disposing of the pyramids by the Egyptians. "Whether or not there are Jews or pharaohs in present-day Egypt is irrelevant. Their legacy is sacred.  It is part of the Egyptian national heritage." Weintein also evoked the ancient Ben Ezra synagogue located inside the Roman fortress of Babylon (Goshen) in Old Cairo where the famous Cairo geniza were found in the early 1890s. "This event revolutionized medieval Jewish studies. The secret cache in Ben Ezra yielded papers, thousands of bits of books and records telling the story of Egypt's Jewish community and national events in the Middle Ages, mainly the 10th to 13th centuries." Perhaps the Jewish community will not have to wait until the remaining synagogues of historic, architectural or intrinsic value turn 100. According to an article (Middle East Times on June 2-8, 1996) there is an on-going effort by the Egyptian Supreme Council for Antiquities to accord three Jewish synagogues 'protected monument status' despite the fact that neither one is a century old. Those listed in an Antiquities Department 16 May 1996 resolution are the Moussa al-Dorie synagogue in Abassiya, Etz Haim in al-Daher, and Shaar Hachamaim in central Cairo. The last was built circa 1904 and considered the largest in Cairo as well as being the center of Egyptian Jewry. According to Mr. Mohsen Rabia of the Antiquities Council, Antiquities Law of 1984 says buildings can be given special status by the Council after they have been standing 100 years. Since the time when the law was passed, eight synagogues and a designated part of the Jewish cemetery of Bassatine - were the geniza papers were located - have been adopted by the Council. "Of the 18 Jewish monuments left in Egypt most date from the early part of this century," said Rabia. The oldest ones were the first to be adopted by the Council, such as the synagogue of famous Jewish philosopher Moussa ibn Maimoun otherwise known as Maimonides, and Haim Capucci synagogue. Both are situated in Cairo's old Jewish Quarter. Other nearby synagigues are in a considerable state of disrepair. Whether or not Mr. Emile Rousseau, president of the Jewish community, has been formally advised of this development remains to be seen. He was not available for any comment since last June. 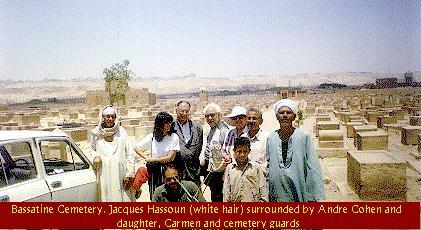 - Jacques Hassoun, the well-known author and authority on modern Jewry of Egypt, and president of the Paris-based ASSOCIATION POUR LA SAUVEGARDE DU PATRIMOINE CULTUREL DES JUIFS D'EGYPTE visited the Bassatine Cemetery last June. He confirmed it was a far cry from when he first visited it in 1980 at which time he pledged his association's support to Carmen Weinstein's campaign to save the cemetery from evident ruin. He has steadfastly supported her efforts and was very pleased with the overall results. Hassoun was in Egypt to attend the Lawrence Durrell conference in Alexandria. - Egyptian and German students of the German School in Cairo visited Bassatine Cemetery last December on a class project. They toured the cemetery and some of the private family vaults (Mosseri, Cattaui). They were the first visitors to the new Bassatine cemetery mini-picture gallery that was installed in one of two rooms constructed as storage and office. - Other visitors at Bassatine Cemetery since October 1995 included Israel's ambassador David Sultan, Professor Sasson Somekh of the Israeli Academy in Cairo and Pincas Jawetz, a policy consultant in New York. Our sincere condolences to their family and friends. Let's see if good news also travels fast! Because of your love for your family and because 95% of the marble slabs covering the Bassatine graves have gone missing making it impossible to identify individual tombs (see previous issue), the 'Saving the Jewish Cemetery of Bassatine Association' is prepared to plant a commemorative-remembrance tree with an attached name plaque for any members of your family buried at Bassatine and whose grave is unidentifiable. This will cost 150 Egyptian pounds or equivalent ($45) per individual. You must supply name and date of decease of the family member you wish to commemorate plus your return address so that a receipt can be sent to you. Please note that part of this amount will be applied to the Bassatine Cemetery Fund. 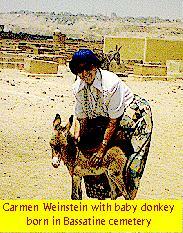 Make your check payable to CARMEN WEINSTEIN (BASSATINE) and mail it to the following address: Weinstein Printing, 28 Cherif Street, Cairo, Egypt. Because the Jewish community in Egypt is an empty nest with no young members (average age 60 and above), we need Hebrew-speaking graduate and post graduate volunteers willing to spend 1-2 months each summer to work on cataloguing, sketching, marking, researching the Bassatine Cemetery and transcribing the Hebrew inscriptions. Work includes spending hours in the Main downtown synagogue library, the American University in Cairo library, the Greater Cairo library and Ein Chams University's School of Oriental Languages. Reasonable accommodations can be found. Arrangements should be made through or in cooperation with a recognized Egyptian or foreign cultural institute operating in Egypt.